A package of rayon threads worth 100$ was missing... I had ordered it in the first week of July and it didn't reach me.There was absolutely no information even from the USPS tracking .Were those threads meant for my stash, maybe I wouldn't have felt so bad (???) .The threads were meant for those who had learnt BE from me. How could I tell them this? So,... I took my own stash ,divided it into different packages and mailed them to all concerned. That's it!!..Gone!! my hard earned bunch...sigh!! And that made me take up a new project with whatever threads I've left. I had to atleast have the pleasure of using some threads before I lose them too in one way or the other. This mini pattern is titled Pandora and Ruby .It's a Rosalie Wakefield design. I've followed 50% of her instructions and the remaining 50% is mine. Here's Ruby the humming bird from another angle. I plan to continue this piece alongside the schwalm whitework . Let us see how the whole bunch of miniatures turn out. Deep, that is terrible. 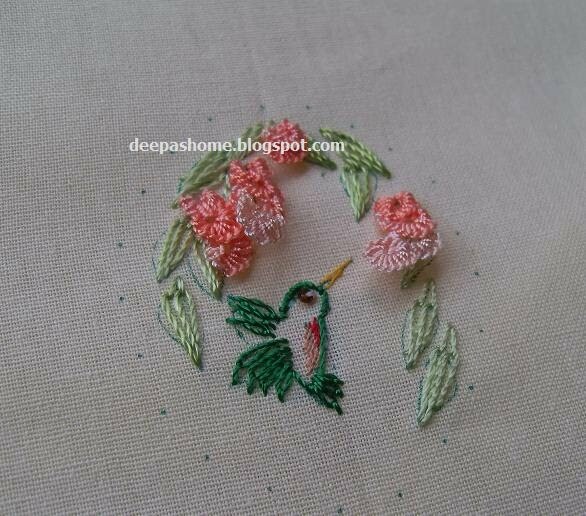 Your lost package, not your embroidery, which is beautiful. Have you contacted the company you placed the order with, if it not showing up on USPS perhaps they have not sent them yet. You should follow it up. I do hope that you receive them soon. It doesn't matter if they were meant for your stash or for your students. No one wants to loose such precious items that don't come cheap. I hope they just got misrouted and are on the way to you. I love your design and your lovely work. I haven't worked on anything for over a year as I began an online course in hopes of finding a job. If I'm not cooking, cleaning or doing laundry I have my face in my books. It doesn't come as easy at my age. I hope to finish soon as the time goes by I feel more stressed......would like to enjoy some stitching time. I hope the package arrives soon! Thanks for your comment, I appreciate all the thoughts and prayers. Iam still hoping I'll get the package one fine day. But my stash is gone anyways .I will have to start collecting them all over again. Hey Deepa! !I know how frystrating it must be for you! !But you will get it..Dont worry..Lovely work on the embroidery as always. Giving up your stash so that your students may go on in their trials is creditable but you have painstakingly collected the colors and the shades and that does hurt. I do hope that you get your package soon. Your latest design is beautiful and I want to see the rest of the series soon. Very nice work. Hope you get your package soon. I can imagine how painful it is to give away your stash...but then it is delightful to collect items to build a new stash, isnt'it? Allmost sinful! The miniature is exquisite. i hope that I could embroider like that. 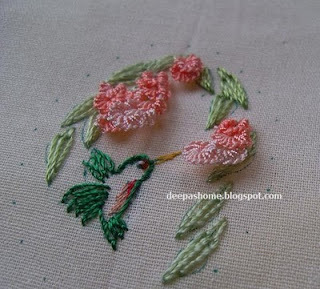 Deepa, I so enjoy your lovely embroidery, your tutorials, and the thoughts you share. Hopefully you will eventually receive the threads that have disappeared. A similar thing happened to me once. Embroidery supplies that I had ordered didn't arrive. Three times I contacted the shop about the missing order. They were unconcerned. The last time I contacted them, they actually looked up the order and found that it had been returned to them because the address label which they had attached was illegible or damaged in shipment, and they re-sent the damaged package with a new label! Needless to say, I will not order again from this company because of their nonchalance and carelessness. I wish you better luck with your source. That's a lot of money to pay for something you didn't receive! Best of luck! Hi Deepa...I feel very bad for you to loose that order. You never know,you might get it yet. Of course rayon threads are very expensive and one can not afford the loss.Your work is beautiful as always. I like the embroidey pattern and I might use it one day.At the moment I am working on some new totes. Deepa... I am so sorry your parcel has not arrived yet... I hope, like mine, you will get it in due course... I somehow missed this post during my "time out" (I was under the weather for a while), and it wasn't until Mum told me what happened... as I said, I do hope you get it soon - if you ordered from the same place you ordered from before (in the States), I would contact them because they seem very nice to deal with and see if they can let you know when they sent it... also, if it is like Canada, they cannot get a tracking number, but they are usually given a number to call so they can see if they know where it is sitting - do you know if they sent it airmail or parcel post (the one I sent was parcel post, thus the delay) - definitely worth checking into with an email to them. Hang in there. Hugs. An incredible gesture of yours that you parted with your stock of threads so that your students wouldn't suffer. I'm sure you would receive your consignment soon. did you contact the store that send you the package...i have the experience of lost package and they have send me a second lot...you might need to wait for some time...there is a time limit for them to declare it is missing. 100$ package is not small money.....from US, you can expect a delay of 4 weeks. It will have custom check also in India...and you can expect a torn up package...hope and pray that it will reach you soon even if it is late.